The Irish and British governments should use an intergovernmental peace process body to plot a way forward for Northern Ireland if devolution is not restored, the Taoiseach has said. 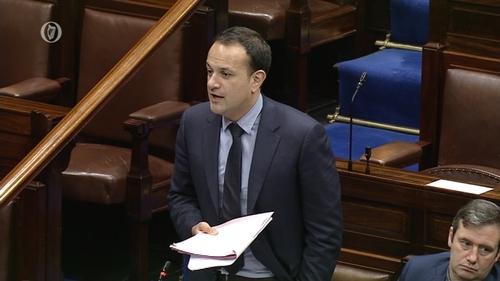 Leo Varadkar said he would urge the recall of the British Irish Inter-Governmental Conference if a deal to revive power-sharing proved elusive. The bilateral body, a construct of the 1998 Good Friday Agreement, brings together Irish and UK ministers to encourage cooperation on matters of mutual interest in Northern Ireland. It last met in 2007. Mr Varadkar said his Government was opposed to a return to direct rule from Westminster as it existed in Northern Ireland pre-1998. While Sinn Féin has been calling for a greater Irish role in resolving the impasse, DUP leader Arlene Foster has dismissed the BIIGC as a "talking shop". Sinn Féin's Pearse Doherty asked Mr Varadkar about the conference during exchanges in the Dáil on Tuesday. The Taoiseach said he had discussed the power-sharing impasse with Theresa May at a summit in Sweden on Friday. "As I have done at previous meetings, I said to Prime Minister May that the Government could not accept a return to direct rule as it existed prior to the Good Friday Agreement and that if Sinn Féin and the DUP failed to form an administration, the Government I lead would expect the Good Friday Agreement to be implemented without them. "That means convening the British-Irish Inter-Governmental Conference, as if nothing is devolved then everything is devolved to that conference. "I indicated to her I would seek a meeting in the new year of the British-Irish Inter-Governmental Conference so British and Irish Ministers could meet to plot a way forward for Northern Ireland in the absence of the elected representatives in Northern Ireland being able to form an administration." His comments come after DUP leader Arlene Foster said recent comments by Sinn Féin amounted to the "glorification of terrorism" and made the restoration of power-sharing more difficult. Speaking after meeting Mrs May in Downing Street, Ms Foster said that any agreement had to work for both unionists and nationalists, and that the activities of Sinn Féin were not helping. "We did say to the Prime Minister that the glorification of terrorism at the weekend at the Sinn Féin conference was making it more difficult to bring around devolution," she said. At the Sinn Féin Ard Fheis in Dublin tributes were paid to the late Martin McGuinness. One of the loudest cheers of the conference came when delegates were told that the former Stormont deputy first minister had been a "proud member of the IRA". Sinn Féin President Gerry Adams, deputy leader Mary Lou McDonald and Northern Ireland leader Michelle O'Neill were in the Sinn Féin delegation for this morning's meeting. Mr Adams said: "I didn't see any glorification of anyone at the Ard Fheis. Asked about the difficulties in striking a deal with the British government, Mr Adams added: "I'm too long going in and out of this place to let anything annoy me. Ms O'Neill said they told Mrs May that the British government "must bear the greater responsibility for the failure to reach agreement on the restoration of the institutions". She said it also emerged that the government intends to include a statue of limitations "covering all Troubles-related incidents" for British crown forces in the Stormont bill, which she said Sinn Féin was not informed about, despite months of negotiations. She said: "We understand the Irish Government was not informed either until we brought it to their attention. "We told Mrs May that this is an act of bad faith and is unacceptable." Following the meetings, Mrs May issued a statement in which she said she had made clear to both delegations the government's determination to re-establish a fully functioning executive that works for everyone in Northern Ireland. She said that both Sinn Féin and the DUP had "expressed their commitment to seeing Stormont back up and running" and that divisions among them are "relatively small in number focusing mainly around culture, legacy, identity and the future stability of the devolved institutions". Mrs May said she does not underestimate the challenges involved, but believes agreement can be reached, adding that it is "imperative that the parties re-engage in intensive discussions next week" to resolve outstanding issues and form an executive. One of the key obstacles is a proposed piece of legislation to protect Irish language speakers in the North. Sinn Féin has argued an Irish Language Act is an unimplemented commitment from the 2006 St Andrews Agreement that first paved the way for the republican party to enter power with the DUP. The DUP remains opposed to a stand-alone bill and have instead suggested a cross-community act with provisions for both Irish and Ulster Scots. The party claims the Irish language provisions within the St Andrews Agreement related to a side deal between Sinn Féin and the UK government and was not approved by it. Multiple UK government-set deadlines to form an administration have fallen by the wayside and the region is edging toward the re-imposition of direct rule by Westminster. While Mr Brokenshire insisted the move was not a step on the road to direct rule, many politicians in the North disagreed and characterised it as a huge stride to London taking up the reins of power.